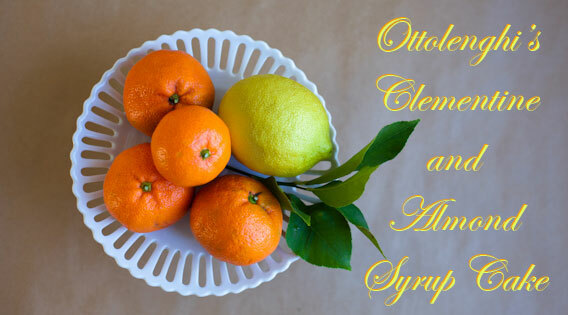 This simple flavorful recipe for a Clementine and Almond syrup cake, from my friend Yotam Ottolenghi’s latest cookbook Jerusalem, has become my first choice for dessert, whatever the occasion. 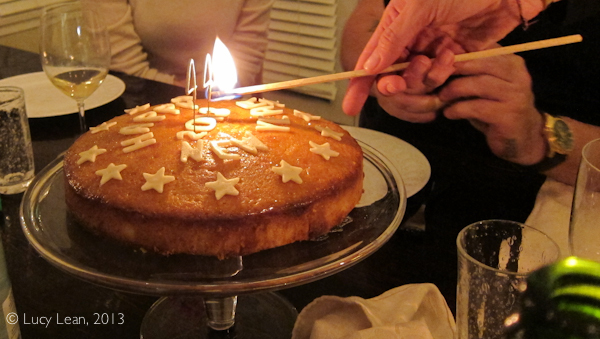 The first cake I made was for Julie’s birthday back in December, decorated with a simple heart sparkler. 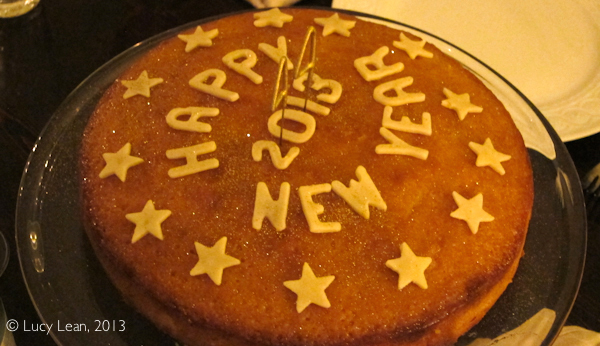 Over the holidays I have baked it numerous times – not least for New Year’s Eve this week. As with everything, each time I tweak the recipe slightly, improving upon an already near perfect recipe. The first time I baked it I made the classic mistake of adding all the sugar and not reserving 80g for the syrup – the perils of recipe writing when it comes to dividing ingredients, so here I’ve separated the all important syrup ingredients from those for the cake. In Jerusalem there is an optional chocolate icing – rather than turn this cake into a Terry’s chocolate orange I’m sticking with the basic version and just adding lots of citrusy syrup. I decorated the top of the New Year’s cake with marzipan letters, 2013 and sprinkled the whole thing with lots of gold disco dust. This has become a favorite over the holidays – edible glitter – I mean does it really get any better than this? 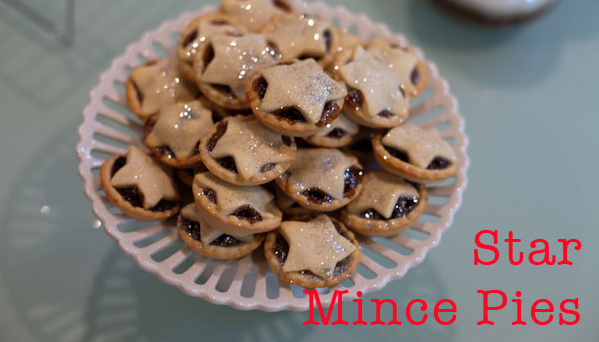 There were silver sparkles on mince pies and gold sparkles on cakes, fondant decorations and cookies. 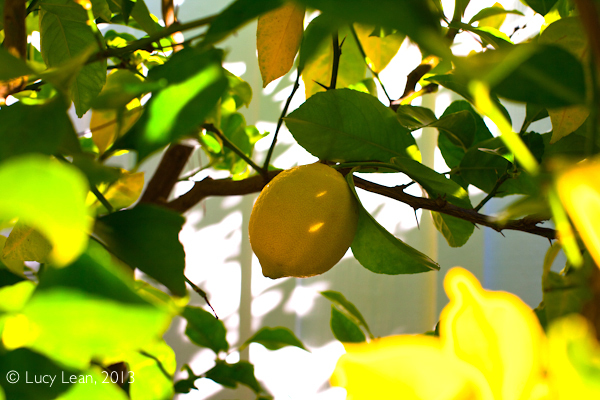 As day turned to night the top of the cake twinkled in the lights. And then just because I felt like we needed a little extra wow factor for the start of 2013 I added a couple of sparklers. Which proved extremely hard to light, although the extra long Jonathan Adler matches I had given Krissy for Christmas were put to good use – I can only imagine how many regular matches we would have had to strike to light these. And then the sparks flew and everyone was happy and we all laughed and toasted as we welcomed in 2013 – and I slightly missed not having a song to sing – no one knows the words, let alone the meaning – to Auld Lang Syne – the Robbie Burns poem traditionally used to sing in the New Year and I wasn’t about to try to teach my French friends gathered around the table. 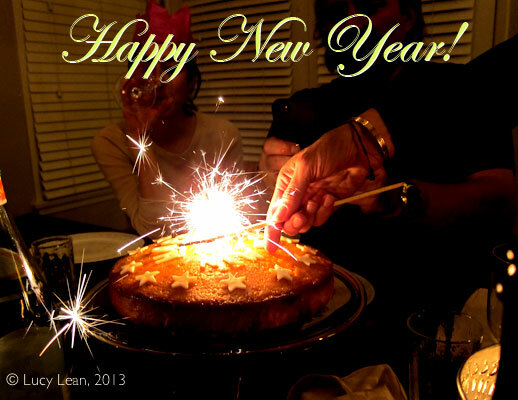 “Should auld acquaintance be forgot and never brought to mind?, Should auld acquaintance be forgot, and auld lang syne?” – for the sake of old times, as we head into a new year I am immensely grateful for friends, old and new, near and far – I wish you all a very sparkly 2013. 1. Preheat the oven to 350 F. Lightly grease a 9 1/2 inch non-stick spring-form cake pan. Line the sides and base with baking parchment. [I have made this cake without the parchment in a non-stick pan and it comes out fine – the sides are a little darker but the end result is just as delicious]. 2. Place the butter and sugar in the bowl of the KitchenAid and using the paddle attachment mix on a low speed. Unlike most cake recipes you don’t want to over work the mixture or incorporate a lot of air. 3. Add half of the ground almonds and mix in. 4. Gradually add in the eggs with the machine running. Stop to scrape down the sides so that the mixture is completely smooth. 5. Add the remaining ground almonds, flour and salt and mix just until fully incorporated and smooth. 6. Transfer to the cake tin and level the batter out with a spatula or palette knife. 7. Bake in the oven for 50 minutes. Insert a skewer into the center of the cake – it should come out moist. The cake may require 10 more minutes of cooking time. 8. When the cake is almost cooked through make the syrup by heating the 80g sugar with 120ml of the lemon/clementine juice over medium-high heat. When it comes to a boil and all the sugar has dissolved it is ready to brush over the cooked cake immediately when removed from the oven. When all the syrup has soaked in to the top of the cake sprinkle with disco dust and leave to cool completely in the tin. 9. 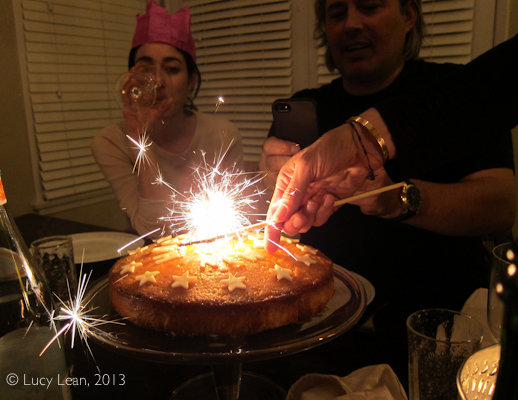 Yotam suggests garnishing with strips of of orange zest – I prefer a little more sparkle – hence the gold disco dust and sparklers, Happy New Year 2013 and stars placed around the top of the cake. The cake will store in an airtight container for up to three days and improves with age. It’s great for breakfast the following morning with a cup of coffee and the paper!